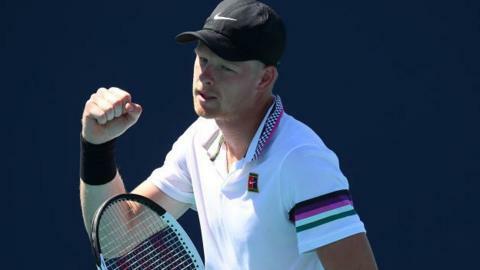 British number one Kyle Edmund produced a classy performance to beat Milos Raonic in straight sets and reach the fourth round of the Miami Open. Edmund, 24, did not face a single break point as Canada's Raonic struggled with a back injury which needed physio and medication on court in the second set. In blustery conditions, Edmund's forehand was key as he took two of his three break points in a 6-4 6-4 win. He now faces American defending champion John Isner in round four. Isner overcame Spaniard Albert Ramos-Vinolas 7-5 7-6 (7-6) on Sunday to reach the last 16. "Isner is a similar match up in that you have to try to get his serve back," Edmund said after his win over a player ranked eight places above him. "It's more just how heavy his serve is and how tough it is to read. I have nothing to lose and have to give my best. I'm feeling good. "Today it was tricky conditions, blustery and you couldn't predict anything. To be able to break him once in each set was huge." Number one seed Novak Djokovic saw off a brief rally from Argentina's Federico Delbonis in a match that lasted just over two hours. The world number one progressed 7-5 4-6 6-1 and will now face Spain's Roberto Bautista Agut in the last 16. "I thought I started well," Djokovic said. "I had a couple of really bad service games. I played too passively. Credit to him for swinging through the ball really nicely. He was dictating. I was too passive. "The first couple of games of the third set were crucial. Managing to hold and put myself in front put slightly more pressure on him. I thought I finished the match really nicely."